An old friend, let’s call him Helmut the German, for that has become his name, is on a cycling tour of the UK. He’s been keeping us up to date with posts on his blog, and this morning posted his latest report on his day in Salisbury. One photo shows a collection of leather drinking vessels of various dates probably from the second quarter of the seventeenth century onwards. 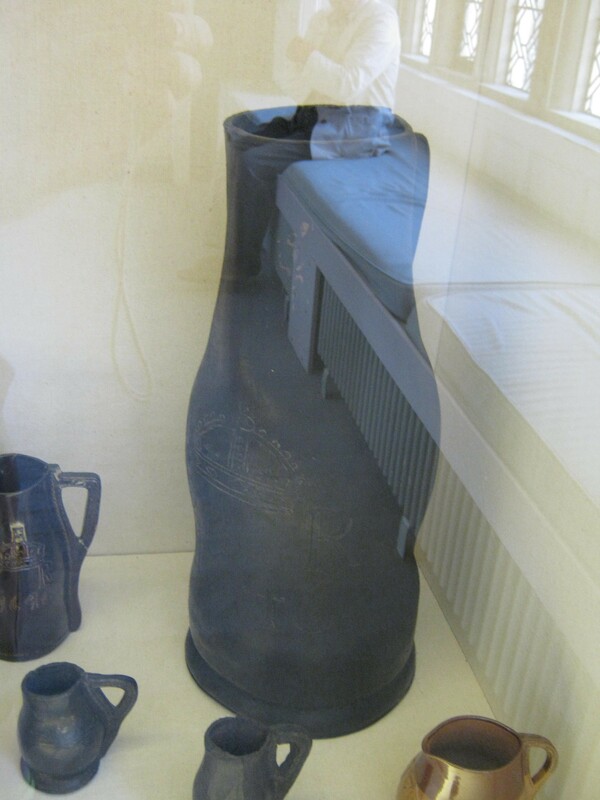 On close inspection, the bombard to the right seems to have been the prototype for the Salisbury Jug I wrote about a short while ago. It looks to be about two gallons, so is roughly eight times larger than the ceramic copy. The one to the back left is contemporary with the bombard and should be a quart (1200ml) based on both the minimum legal measure at the time and the scale of the reflections in the photo. The newer 18th century jacks in the foreground would then be about pint each, which again is right for that period. Victorian period ceramic Salisbury Leather Jug. 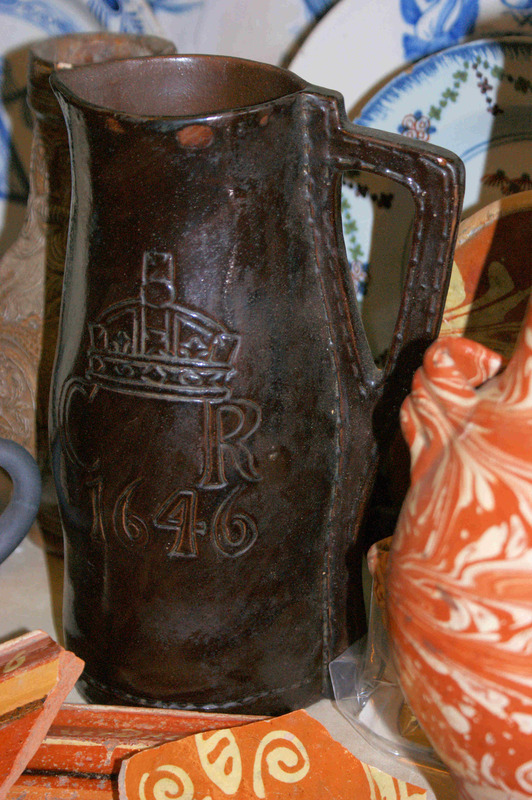 Supporting my hunch about the potter moving the decoration to the side, on the leather version the crown and letter “R” are clearly seen on the front (opposite the handle) in the photo and I think I can see the numbers “46” below that. I had been expecting the decoration to be painted on, but the photo shows that it is incised, much like on the ceramic copy. Today’s Daily Mail contains a report on an 18th century Dutch ship found 30m deep in land reclaimed from the Hudson River. 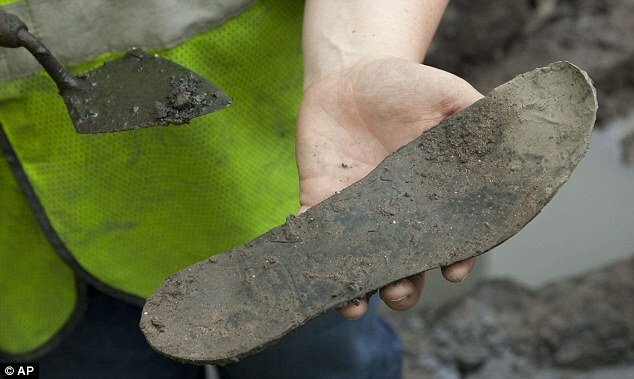 The fourth photo down the page is of a shoe sole fom the site. It appears to be an innersole and clearly shows the owner’s foot and the stitch holes around the heel. Construction appears to be similar to the Smeerenberg shoe. I’ve pulled the photo in from the paper’s website below, I don’t know how long it will last. I’ve finally finished. It shouldn’t have been this difficult but I had problems at almost every stage. The front wasn’t properly moulded, the back went concave on a damp day, I stabbed myself numerous times with awls and needles, once so badly I had to stop for the night. I was using an unfamiliar awl because I’d broken my other one. I’ll do another one soon so I can have one where everything does go right. I remoulded the front an back to bring the margins into line. To fix the problems with the front piece from last time, I dampened the edges and put it back into the press without the core. This allowed the sewing margins to pull down properly flat so it didn’t stress the back any more. 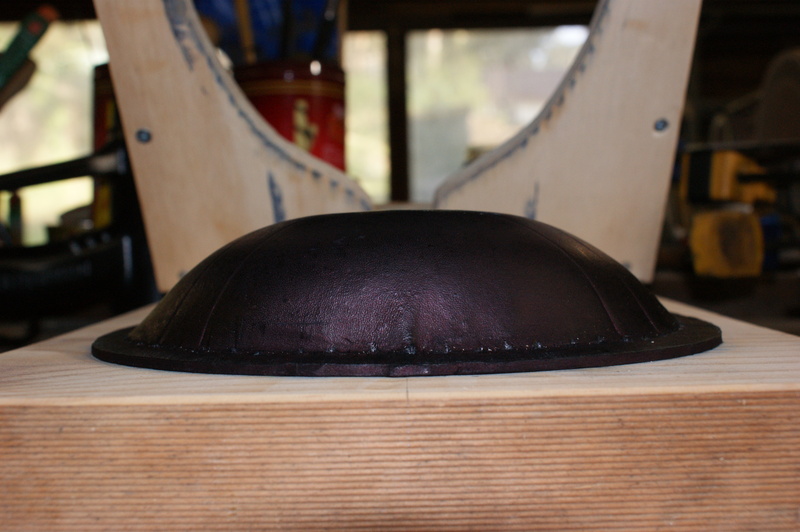 I remoulded the back with the core in to pop it back into shape, then left everything for a week to dry thoroughly. Finished remoulding without the core. The margins now sit flat. 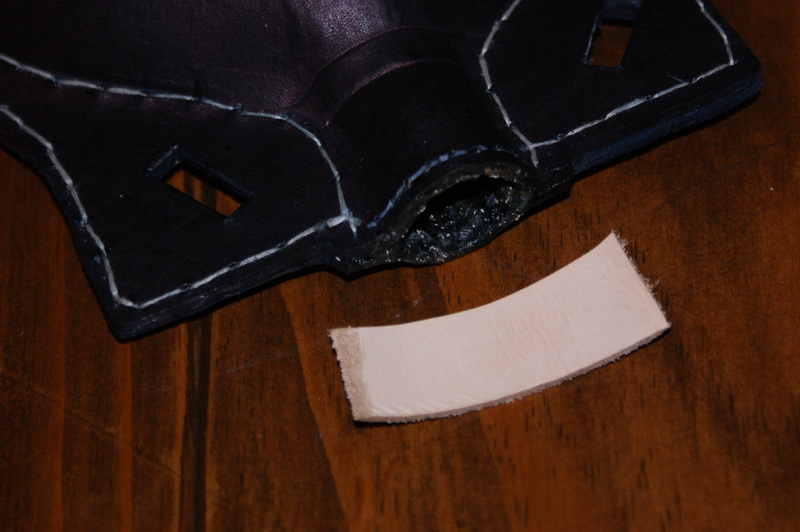 I cut the front to the final shape before stitching, leaving the back so I could trim it to shape once it was in place. I don’t have a lot of success getting theoretically identical pieces to match up properly, so I use this as a work around. The stitching is simple, so I won’t go into it here, it’s the same coarse pitch saddle-stitch used on the costrels, jacks and buckets. Once sewn, trim the back to shape and using 1/4″ and 1″ wood chisels, cut the carying holes. Make sure the bevel is facing away from the hole, otherwise the hole will end up with sloping sides and be too bit on the back. Dye all the cut edges. For the LOLs, try blowing into it and see if you think blow moulding could possibly work. I use honey pitch for bottles as you can’t see the pitch once the neck gasket is sewn in. This saves my hideously expensive and hard to get black pitch for jacks and bombards where it can be seen. Heat the pitch until is is molten, but not too hot, and pour in. I like to have it at least a third full. 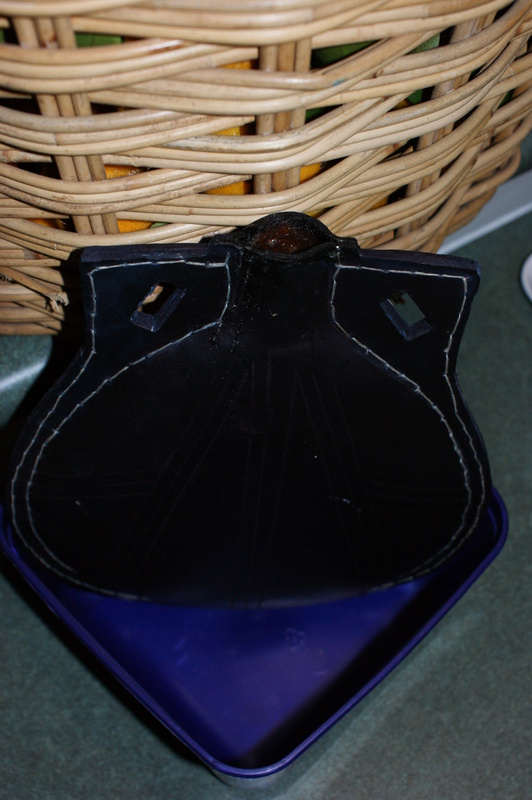 Turn the bottle to run the molten pitch along all the seams and the leather and then pour out. Repeat the process, this time mainly paying attention to coating all the leather surfaces and pour out again. When pitching, I had a blockage in the funnel and ended up with pitch everywhere and by the time I’d cleared that and started to pour it out again, it was too cool and I had to get the hot air gun involved. Allow the pitch to cool, then test by filling with water and standing in a container that is able to hold all the water if it leaks out. Overnight tests are good. Sometimes a slight leak will show by the water level dropping and a dark or cold patch on the outside of the bottle. If there’s a slight leak, pop it in the oven at around 65 degrees celcius for a couple of hours to reflow and seal. Turn the oven off and leave the bottle there for a few more hours so the pitch doesn’t craze from cooling too rapidly. Testing for watertightness. The ice cream bucket is in case of catastrophic failure. Throwing it in the oven usually does the trick. If the leak is more severe, you’ll have to do more pitch and retest. Just like I had to do for this one. Of course it leaked and 4 hours in the oven wasn’t enough to fix it. The final step is to make and sew in the neck gasket. This is a strip of 1mm leather about 25mm high that goes around the neck of the bottle and helps the stopper seal it. Shave a chamfer on the short edges, one on the flesh side, the other on the skin side. That way they’ll sit flat when finished. 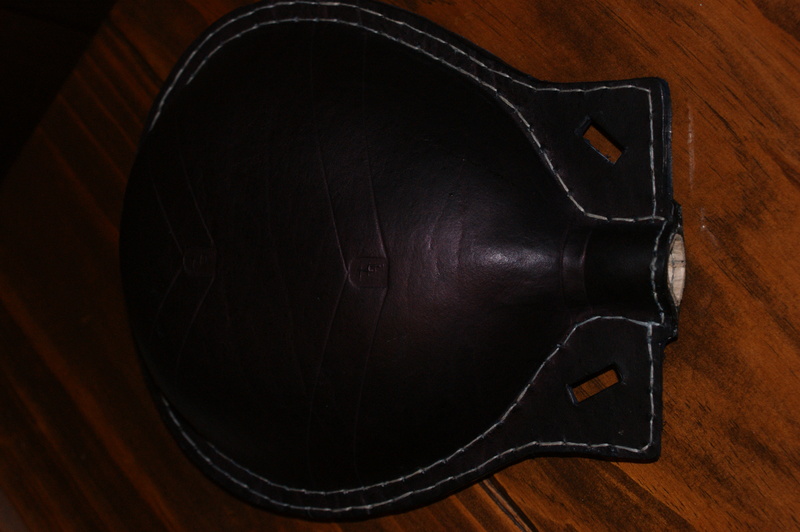 Sew in place with the skin side up using a saddle stitch on a 5 or 6 stitches per inch pitch. The neck gasket ready for fitting. Both edges are skived to sit flat when overlapped. Now make a stopper – I usually use a branch from a suitable tree and shape it with files, a knife, sanding or a combination of the three. Some people turn theirs, I’m usually accurate and quick enough without resorting to a lathe. Some of the Mary Rose stoppers have a leather cover, carve/file a step in the stopper so the leather is flush with the timber and secure with edge-flesh stitches. Ta-dah! A finished flacket with stopper. That took about three times longer than it should have. I’ll do a brief post on the next one so you know how it went and how long it takes, but I have another costrel on commission in the meantime.